Visit the 'Cherry Blossom Capital of the World' in Georgia and stay at this interior corridor Best Western Riverside Inn in Macon. We are located in the heart of Georgia off of Interstate 75. Our hotel provides easy access to local tourist attractions including the Georgia Music Hall of Fame, the Georgia Sports Hall of Fame and the Macon Coliseum. Guests traveling on business will appreciate the close proximity to corporate locations such as the Cigna Corporate Center, the Georgia Farm Bureau and McDonnell Douglas. All newly renovated guest rooms feature high-speed Internet access and cable television with HBO . Guests can enjoy cocktails at the onsite lounge. Hotel amenities include an outdoor pool, exercise facility, meeting facilities and a complimentary full breakfast. Pets are also welcome. The Best Western Riverside Inn is one mile from downtown Macon featuring a variety of restaurants and numerous shops. Guests of the hotel will also be close to the Tubman Museum and the Museum of Arts and Sciences. While in town, guests can enjoy the Cherry Blossom Festival in March or listen to music at the Southern Jubilee. 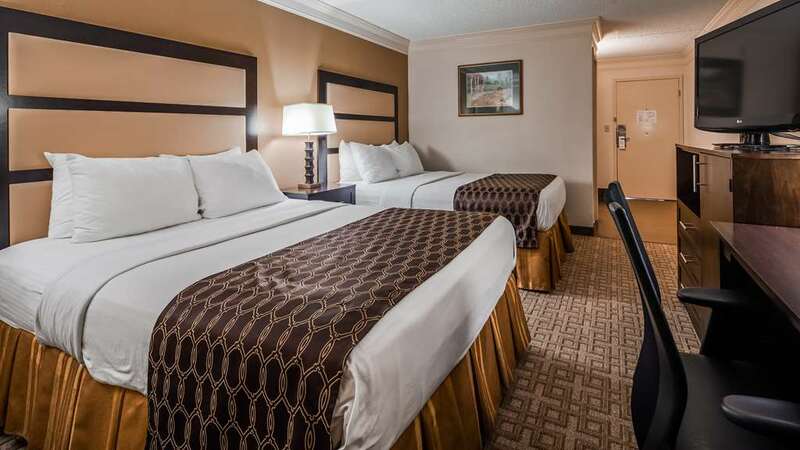 Make a reservation today and save at our Best Western Riverside Inn. Enjoy your stay. From: Interstate 75. Take Exit 167, Pierce Avenue. Turn left on Riverside Drive and travel a quarter mile to the Best Western Riverside Inn.